4. Encourage your users to install the Kicktraq plugins for Chrome or Firefox, which embeds one of the charts for each project right on the top of its Kickstarter project page, and encourages users to visit your Kicktraq project page for additional news and statistics. The key to beating The Bumbler in your quest to hit the Kicktraq Hotlist is to keep your backers – er, sidekicks engaged. Help us help you do that by encouraging them to be Kicktraq users. 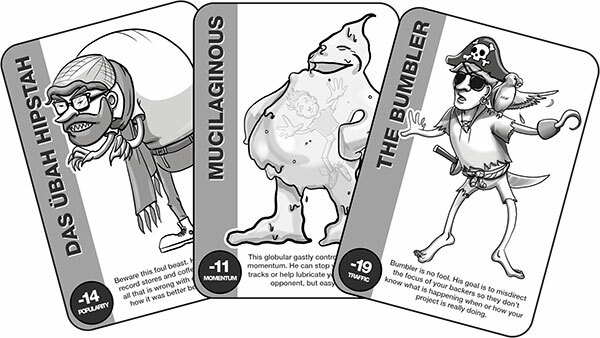 “Mucilaginous” – In our Hotlist calculations, momentum is a minion whose loyalties are up for grabs. Your project’s momentum may jump high due to a spike in pledge and backer count on a given day, but if you don’t sustain that momentum from one day to the next, your hero may be punished. Think of momentum as a +/- bonus to traffic – It’s not about the count of sidekicks or pledges your hero has gained on a given day, it’s about change from one day to the next. Did your momentum go up from yesterday? Or down? This bonus allows smaller projects to defeat The Bumbler (since they’d never have as much traffic as the bigger, more famous heroes) by giving small projects a slight handicap in their quest for Hotlist status since their scale is smaller. “Das Übah Hipstah” – To achieve Hotlist status, your hero must beat the other active projects in a popularity contest. Popularity is judged by comments on your page as a percentage of your backers. If you and your backers are chattin’ it up, whether in harmony or controversy, you will win the popularity contest. That’s right, lots of controversial chatter on your Kickstarter comment page is equally as effective as lots of harmonious chatter between you and your backers when aiming for Kicktraq Hotlist status. Das Übah Hipstah is beaten solely on quantity of comments as a percentage of your backer population, not the content of those comments (hey, who are we to judge?). This is why you sometimes see projects like Lore or the project about the 9 Year-old’s RPG camp tuition jump high enough to be noticed on the Kicktraq Hotlist. Unless your hero defeats both The Bumbler and Das Übah Hipstah, you’ll never make the Hotlist, and Mucilaginous can work both for and against your hero – Allowing for small projects on the rise to break through the noise of the popular kids or sending them to the path of non-Hotlist mediocrity when they stall. But, when you defeat them all, they actually work together to help your backers stay engaged with your campaign by knowing where to go and how to share, and they keep your campaign accelerating to your goal and beyond.